I was so happy to be sent a review copy, because I wasn’t looking forward to hauling our tired box of tired decorations down from the attic. Some of our decorations were made to last, but if truth be told the bits of tinsel and the tree decorations are looking a bit shabby. 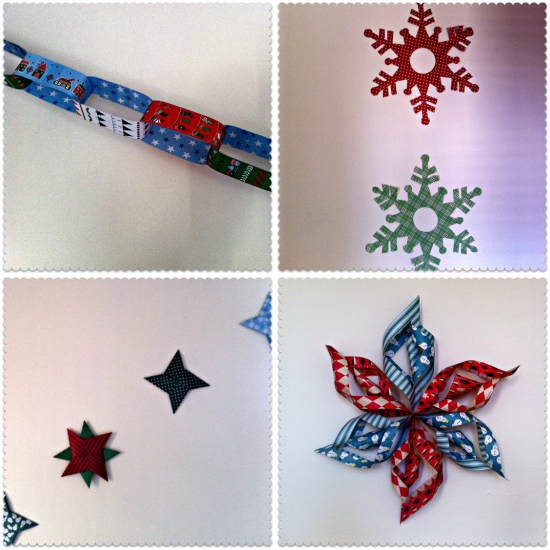 Christmas Decorations to Cut, Fold & Stick works like this. The tear-out pages are filled with dotted lines and pretty Christmas prints, and the book comes with instructions on how to turn the pages into stylish Christmas decorations, from paper chains to angels for the tree. All you need is a pair of scissors and some sellotape. Don’t tell him I told you about the woven hearts though – he has a macho reputation to uphold. 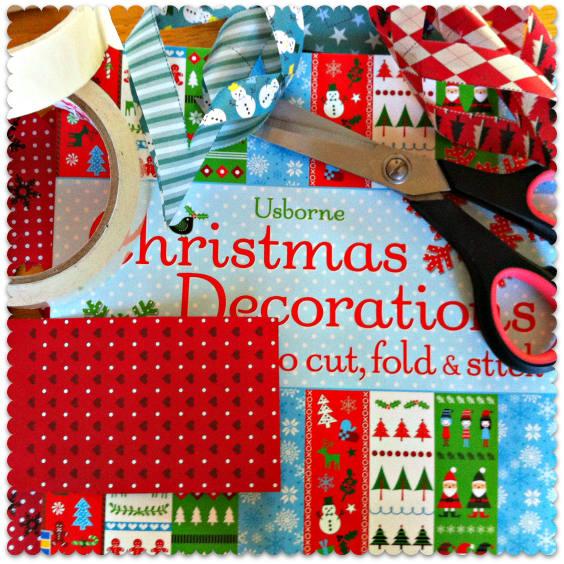 Usborne has kindly provided three copies of Christmas Decorations to Cut, Fold & Stick, to give away to Miss Thrifty readers. To enter: just leave a comment below, with your top Christmas decoration tip. It could be anything from how to keep the tree needles from falling, to your best bargain buy. The giveaway is open to all UK residents. The closing date is 12 noon GMT on Friday 7 December, when the winners will be picked at random from all the entries. This is a short, sweet giveaway, so that if you win, you have enough time to get all these lovely decorations up! 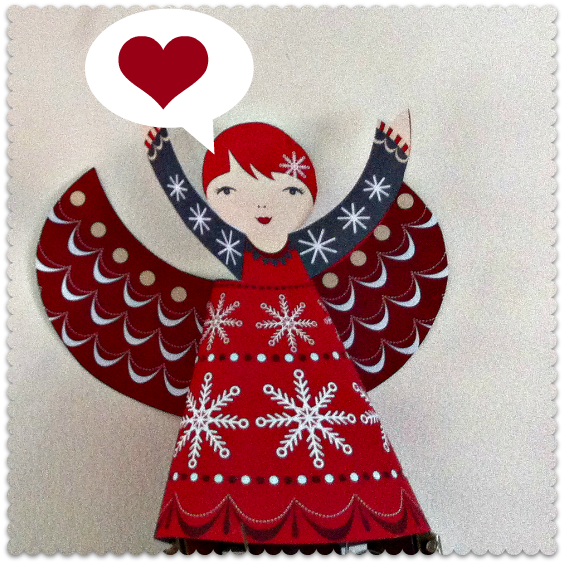 BONUS ENTRY: add your Christmas decoration tip to the Miss Thrifty Facebook page – anywhere on the page will do. UPDATE: This competition is now closed, and the winners have been drawn. They are (drumroll): Sheila and Sue (Miss Thrifty Blog commenters) and Dakiara Constantine (Miss Thrifty Facebook follower). Well done ladies! Looks like a fabulous book – great to have the templates printed on patterned paper so it’s a one stop project book! Put freshly cut holly and fir tree twigs into bargain pewter tankards from you local charity shop. Simple, but effective, and wonderful smelling, mantle/windowsill decorations. 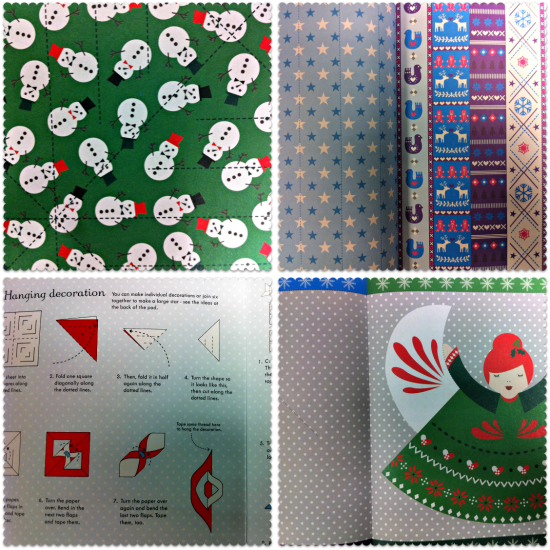 Love the book – great to have the projects and (almost) everything you need for the decorations in one book. My decorating tip: Fill a glass fruit bowl, hurricane lamp or goldfish bowl with coloured baubles and/or battery-operated lights. Lovely book, would love to be an owner! My Christmas make/tip is to paint old jamjars with old nail varnish, patterns/ designs / squiggles ( easily done by any age ) Use them for pen holders, or tea light holders, a great home made pressie! Orange & Cloves – The are so easy to make, just get an orange and put whole cloves into it, then wrap with a ribbon. Not only do they look good, but the smell is incredible! Just do a web search for some great ideas. Miss Thrifty great post, I pinned it on Pinterest. I love Christmas and the smell of christmas my top tip is top up on all those christmas scented candles in the sales and during Decemember you can have several lit up giving that really welcome scent and warmth of christmas, your guests will love it. This year I have been drying hydrangea heads and spraying them gold, they manage to look expensive despite being practically free. Another garden raid is a lost tree branch sprayed silver and hanging with gold sprayed pinecones and jewel coloured baubles. Since I got the baubles yonks ago in a post Christmas sale it’s a cheap year! When putting your christmas lights back in their boxes at the end of Christmas write on the box lid where the lights were from e.g. front room mirror etc. That way you wont be messing around at Christmas time wondering which set fits where! What a sweet book! My top tip is to dress the windows with star ornaments, etc. to get already a festive feeling when you or your visitors come close to your house. As soon as I hang up my forst window ornament, I am in a festive mood. I love to leave cinnamon, cloves, orange and lemon peel in a low setting oven giving a wonderful Christmas perfume through the house. If you get a real tree, this year consider getting a small one instead of the largest you can manage. It will make your room look bigger, allow the kids to decorate it without dangling them above it and any spare tree decorations can be hung off tinsel woven around things in the house. 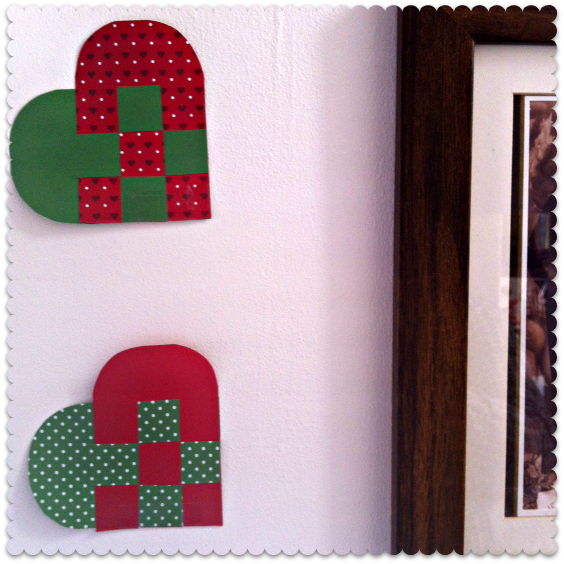 My top thrifty tip for a really great Christmas decoration idea is . . . If you’d like to decorate the front of your home (outside) and have the outdoor Christmas lights but are bored with simply draping them around the front of the house … then why don’t you go for a stroll into your local wooded area (go with a friend or spouse/partner) and find a large a branch which has fallen from a tree (and with the bad weather we’ve just experienced here in Britain there will be a selection). Choose the best branch which suits your needs (you’ll see why in a minute). But don’t cut branches from trees … I think I’m right in saying that it’s illegal to take branches from trees. Make ‘legs’ for it by hammering two pieces wood to the bottom of it in an X shape – adding two small chunks of the same wood to the ‘legs’ which don’t touch the floor – so that they’re level with the the other part of the X shape so it will stand level and won’t wobble. VOILA! A great ‘tree’ to dress the front of your home. …. if you have some white paint available … you could dabble some of the white paint in various places to make it look like snow – and while the paint is wet, sprinkle a little glitter on the paint and allow to dry. Or .. if money allows, you could buy some of that fake snow in a can. If you have a hammer drill with a drill bit which will drill into the walls outside – you could screw some hooks (like cup hooks) into the wall in appropriate places) and string your branch against the wall and decorate it there. Make ‘bells’ from egg boxes (cut out the little beds which the eggs sit in) – and if you wish .. paint them, then simply poke a hole into the bottom and thread some string/cotton through the hole, tie a knot so that the ‘bell’ doesn’t fall off the string, and tie a loop on the other end so that you can hang that loop on the branch. Use your imagination and allow yourself to ‘go’ with this idea and dress it up so it suits you and your home. Collect pine cones – a fun activity with kids – and spray them silver. You can arrange them in bowls or hang them from the tree for some cheap but chic Christmas decorations! Stop Christmas lights getting in a tangle. Cut a rectangle out of an old cardboard box (one of the flaps or an end will do), cut notches in both short sides & wind the lights round the cardboard. Fix the plug into one of the notches when you get to the end of the winding. Much better than shoving lights in a plastic bag to deal with next Christmas! Battery operated lights in a vase are a simple and festive way of christmasing up a room. My best tip is to save money throughout the year – plus take advantage of deals when you see them! I do surveys and stuff like that to top up my Christmas savings every year. My tip is to decorate oranges with cloves and display them in a bowl, looks and smells great! My tip is to fill an empty fireplace grate with white lights and cover in red fabric, when the lights turn on it looks like a fire- very warming! My tip needs a few baubles and some clear thread, and maybe a couple of drawing pins. 1) thread some clear thread across a window pane, maybe 3/4 of the way up, using the drawing pins to attach the the wall on either side or however you prefer. Alternatively, you could do what I did at my mum’s hour and find the wire the net curtains used to be on and hook that back up. 2) tie the baubles onto a single piece of clear thread each, mixing and matching the length of the threads. 3) tie the bauble threads onto the piece of thread across the winow and you have beautiful floating aubles in the window. This looks particularly great with glittery or shiny baubles and a candle or fairy lights nearby so the baubles can catch the light. A bit labor-intensive but very striking and works wonderfully with the cheapest of baubles. i place my tree on a small fold up table and create a kitty barrier of wrapping paper to make it look like it’s too high for my cat to jump on to from the floor. This means i can have glass decorations without the fear of a toppled tree and cut kitty paws. Bonus is that the bottom of the tree looks festive hiding the battery packs for the lights and those ugly plastic feet. Oh, what a book! I like to put wooden logs under the Christmas tree- looks fantastic! We like to use metal cookie cutters as tree decorations. We make the gingerbread men and stars and trees and hang them on the tree along with the cutters! Looks great! This book looks fab! I would love to make the large star you had inn your hallway! Loving your blogs Miss Thrifty! What a cute book. Really remind me of making decorations in with my family when I was little. I would say my decorating tip would be to make it personal. For example at the top of our tree we have a barbie from when I was a kid dressed in her biggest dress and my partner insists on having multi coloured flashing lights as he loves the kitsch Christmas element. it is amazing how much you can make from just white paper! buy a ream of economy / value paper and Get the kids involved … you’ll soon have snowflakes, stars, paper chains, chains of snowmen holding hands, – add a bit of glitter or give them some pens to colour in with too and they’ll have hours of fun at very little cost. I’ve been having heaps of fun both with and without the children. I’ve actually made loads of decs this year. 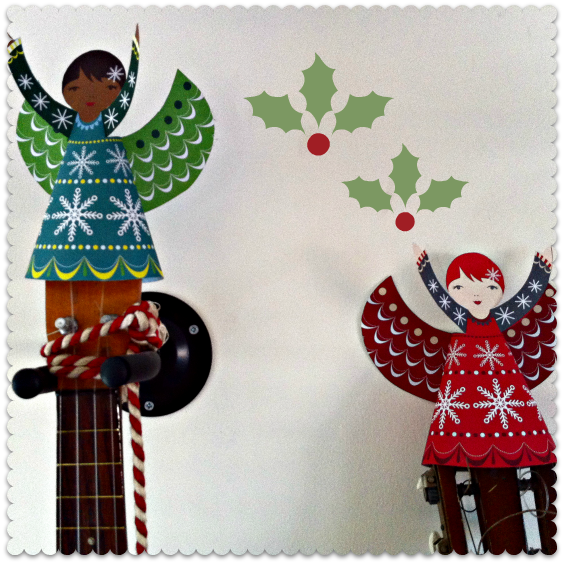 My tip is to upcycle tree decs with paper mache and decopatch. i look out for Christmas decorations all year round on car boots and in charity shops. I have a very small house and little room for a Christmas tree so I use a garden obelisk. My colour scheme is dark red and silver, I put a bunch of artificial red berries inside the obelisk then wrap white lights, strings of silver beads etc around the outside, finishing off with red and silver baubles and an angel on the top. It looks great! I’ve ordered this book half price on the WHSmith website at the same time as my 5% discount stamps so double thriftiness! My thrifty tip is to take a Xmas cookie cutter & a potato to make a potato stamp, find any leftover paint you may have (even household emulstion works) & then potato print on brown paper to make unusual, cheap yet strong wrapping paper! My wife buys cheap baubles and sticks some of her cross-stitched Santas, snowmen, etc. to them. P.S.I am currently cultivating trees that grow their own decorations. Gingerbread decorations: homemade and you eat them so less clearing up after! I love to have a big bowl of pine cones – some left natural, some sprayed silver, some gold, and a few of the plain ones tied with red velvet ribbon – looks great! The book sounds wonderful – thanks for all your wonderful newsletters! This book looks wonderful – a papercrafters dream. My tip for christmas decorating – origami. There are some wonderful origami patterns out there which make great decorations. Numerous stars and you can use any paper – even plain photocopy paper make lovely decorations. Also look out for decorations, cards and wrapping paper in the January sales.